A funny thing happened on the way to the post. By “the post” I mean turning this into a post while I was still in Ireland. You all still love me, right? That’s right. I was in Ireland. Limerick, Ireland, to be specific. 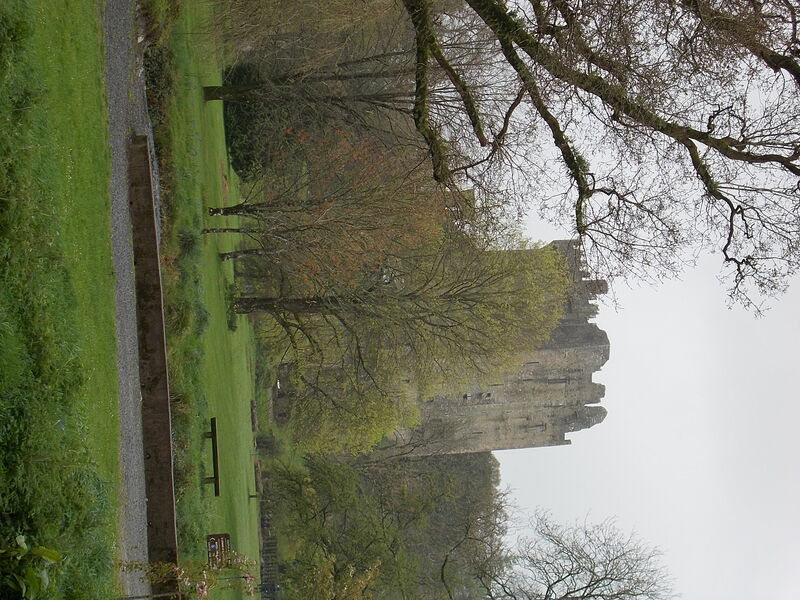 On day the second, we were headed to Blarney Castle and Cork, Ireland’s second largest city. We were picked up at our hotel by our tour guide, whose name turned out to also be Frank. We referred to him as Frank the II when he was not around. He was no Frank I, that was very clear. Yup. That’s it. Blarney Castle. And, you can’t tell, but, it’s raining. This was one of the two days where it rained pretty much all day. If you’ve heard of Blarney castle you know about the famous stone, but, what you might not know is that the castle is a ruin, and it has absolutely no roof. The famous Blarney stone is located at the top of the roofless structure. The way up is via a steep circular stone stairway, which has acquired a lovely coating of Irish moisturizer due to that unfortunate “no roof” thing. There is a rope “banister,” and that is the only reason I made it to the top. 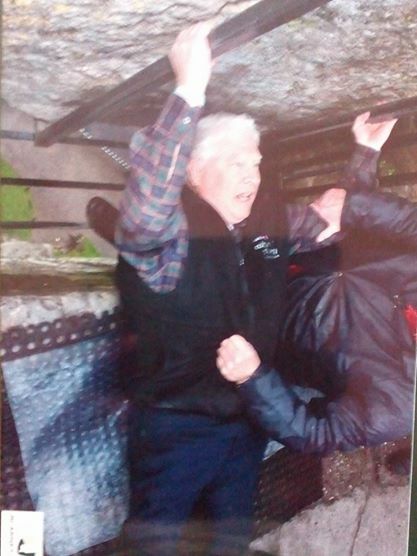 My dad, who is already a gabby individual, was really excited about the whole Blarney stone thing, and had, for the first, and pretty much only time on the trip, shot ahead of me and my sister, and raced up the tower to the top, ready to pucker up with the legendary stone. He beat me to the top by such a large margin, that I completely missed his big moment. The moment I was sure meant that the world would explode from the enormity of the world’s gabbiest guy getting gabbier. Fortunately, like all tourist traps the world over, they have their own photographer, and they will gladly sell you the photo. My sister, who refused to go up the treacherous tower, was only too pleased to buy that bit of blackmail. My dad, smoochin’ a stone. Heaven help us all. My lips were not going anywhere near that filthy thing. Especially because, for some reason (my money’s on a “let’s make the tourists do ridiculous things” tradition) you have to be lying on your back and hang your head, upside down, over the open death-slot to put your lips on a stone kissed by millions. I can’t say that I’m that taken by the notion of third-party stone smooching millions of people in one go. Even if these millions include people like Winston Churchill. One of the things that you never really hear about Blarney Castle is that the grounds around it are really quite spectacular. There are lovely flowers and trees all over the place, and a stream runs through the grounds. There’s a poison garden where you can find all of Snape’s favorite lethal plants, and there’s caves and a dolmen, plus a whole bunch of other stuff I didn’t really get to see. We’d planned to head to the nearby Woolen Mills, to look for a gift for our mom, so we were trying to hurry back to have some time to look. We had started back, and dad was lingering at the gift shop. We told him we’d be just outside, waiting. We waited just a bit down the path back to the bus and the shops. And we waited. And waited. We kept watching the paths, and we retraced our steps. No dad. We posted ourselves at strategic points to see him, and we never saw him. At this point, we only had a few minutes to get back to our ride, before Frank II left us in the rain, so we headed back, hoping that dad would know to go to the bus. We got back a few minutes late, and as I walked up, Frank II pointed into the shops at the Woolen Mills. I was *so* close to launching into a “Don’t make me have to pull this trip over, young man” lecture. Parents. Geesh. You can’t take them anywhere. The group back together, we headed to Cork. For shopping. Most of you know that I’m not so much of a shopper, but, since we’d missed the Woolen Mills, and needed to find something for mom, this was good. Plus, we’d not eaten anything, and it time to find lunch. We left the bus just as the rain got harder, and we spotted a place for lunch. The golden arches called. As we got in, I realized this was the first time I’d ever even been inside an American fast food restaurant in a foreign country. Given the rain, it was easier to stay and eat than to find another place, so, we settled in for a meal. In between bouts of rain, we did see a few things. 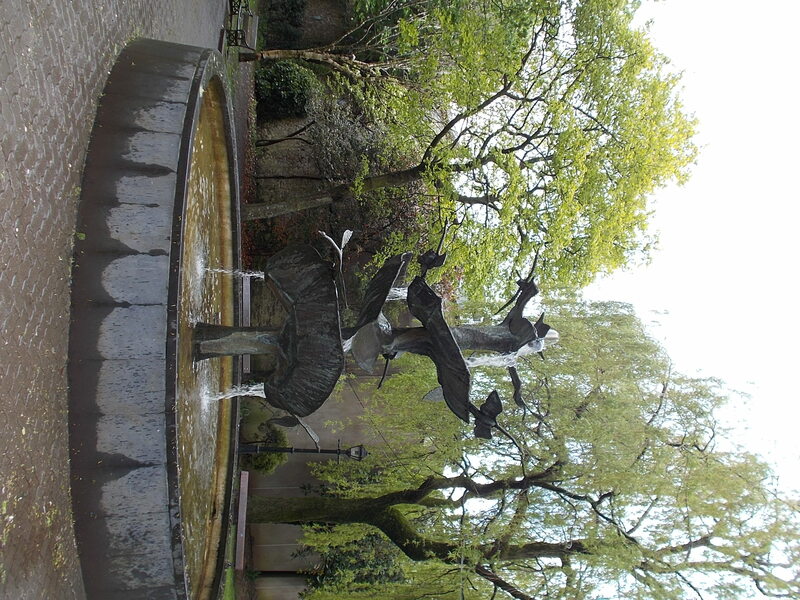 The fountain on the left was just behind the city council building, in something of a small park. It’s hard to photograph. It was a collection of seven large geese(?) artfully arranged like on a mobile, around the fountain. The distant church in the picture on the right?, well, I admit, I have no idea which one it is. It looks nice, though, doesn’t it? 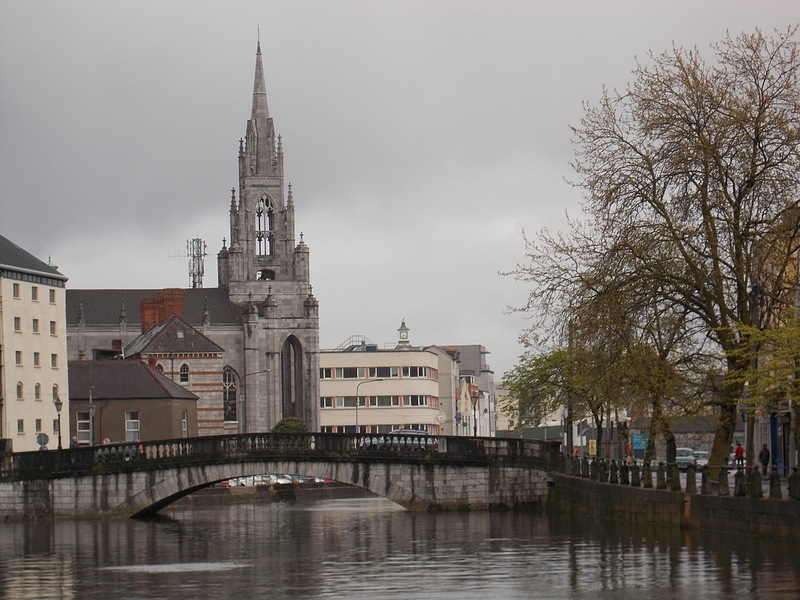 It’s got that nice view of the river, and old and new bits of Cork nicely blended. We did try to find something for mom, but, most the shops had stuff that mom would not find interesting, and the rain was occasionally really heavy, so, we kept trying to dodge into shelter. One of our sheltering spots was a crepe shop that had ice cream. So, we had some. It could’ve been better ice cream, but, it the shop was nicely situated right along the river there, just to the left of the edge of the picture with the church. Eventually, we gave up the search for the right thing for mom, and went around the corner from the crepe shop to wait for the bus to return us to Limerick.